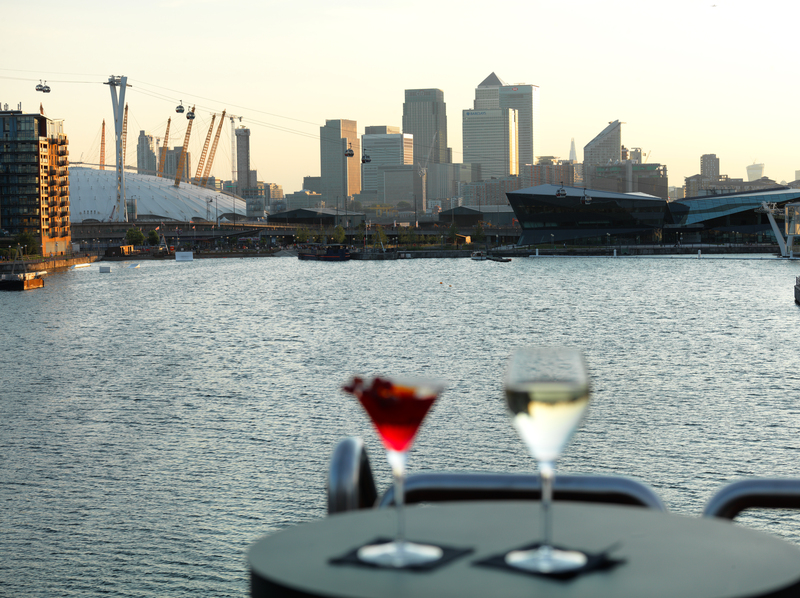 With beautiful cabins, stunning views and delicious food, the superyacht moored by the Excel in East London is not just a four star hotel, but a veritable experience. 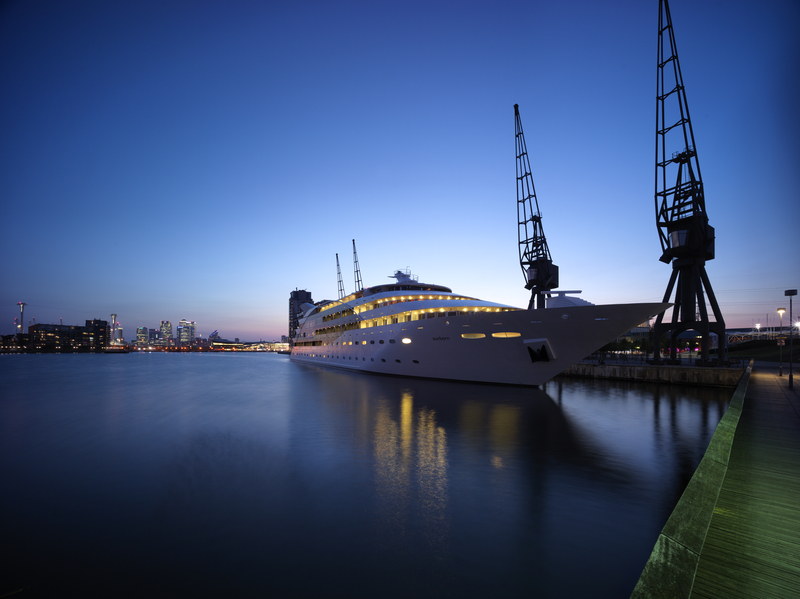 Moored by the Royal Victoria Dock, right next to the Excel, Sunborn Yacht London is the only first floating hotel in the capital. 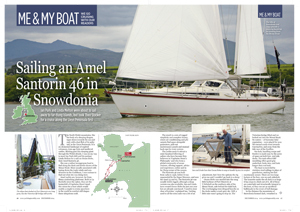 The superyacht arrived in the UK in April 2014 and opened to guests in the autumn of the same year. It’s been very popular ever since, thanks to its beauty, interesting concept, proximity to the Excel and the city and the fact that it has a marriage licence. 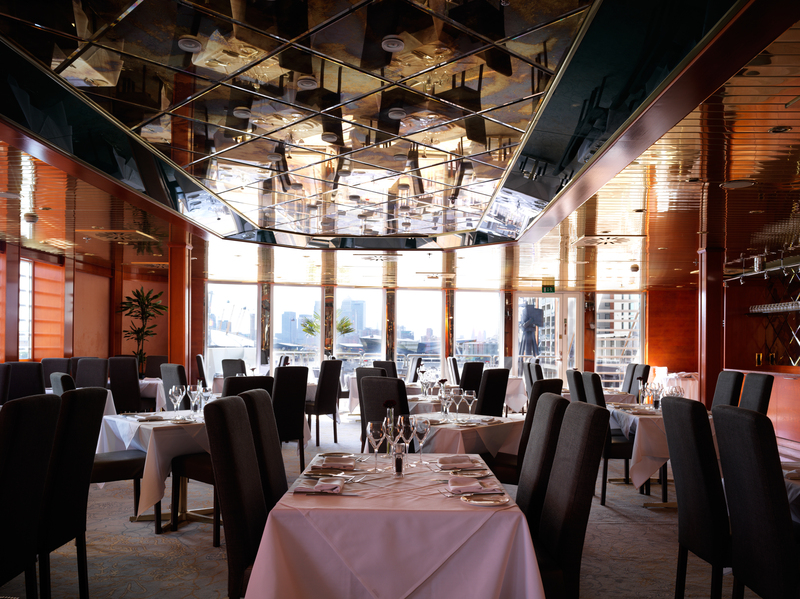 The 128 metre-long, five storey craft boasts 136 roomy and elegant cabins and suites, spectacular views of Canary Wharf and central London, fine dining in the form of the Lands End Restaurant, the Sundown Bar, meeting and conference rooms, an auditorium and for those in need of pampering, even an Elemis SPA. 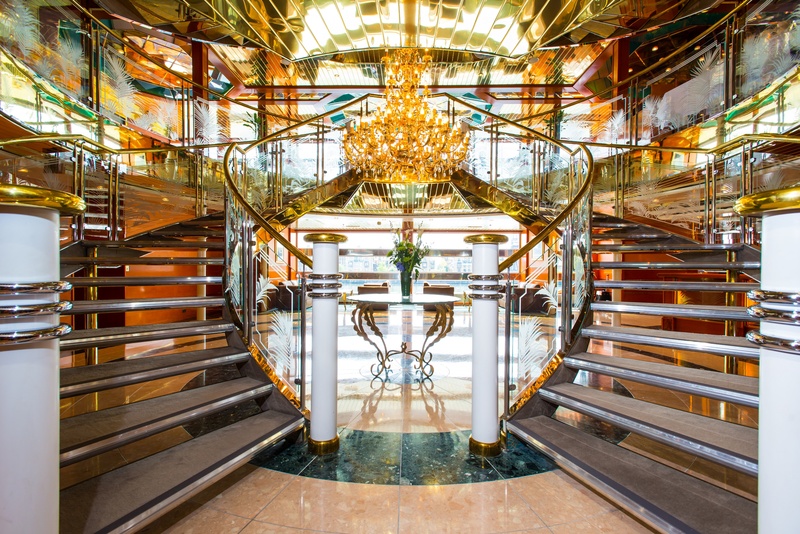 With its grand central staircase, spectacular crystal chandelier, teak wood panelling and brass railings, staying at the Sunborn feels like being on a luxurious cruise ship (albeit one that doesn’t sail, as this yacht does not have an engine). And with kingsize room prices starting at just under £140 per night, this is a cruise that won’t break the bank and it’s certainly cheaper than buying your own yacht or chartering one. We visited Sunborn London on a splendid autumnal Sunday. We were immediately impressed by our spacious and stylish room (a term preferred by the management rather than cabin, which conjures up a cramped space), all wood and clean lines with a comfortable double bed, sitting room area, an all white bathroom stocked with Molton Brown products, mini bar, tea and coffee facilities, a large TV, free WIFI, a tablet and stunning views across the Thames. After settling in, we headed for the Sundown Bar, and enjoyed a glass of wine on deck, watching the sun setting over the London skyline – a very relaxing way to spend the end of the weekend. Post aperitif we headed upstairs to the Lands End Restaurant, were dinner was fine indeed. 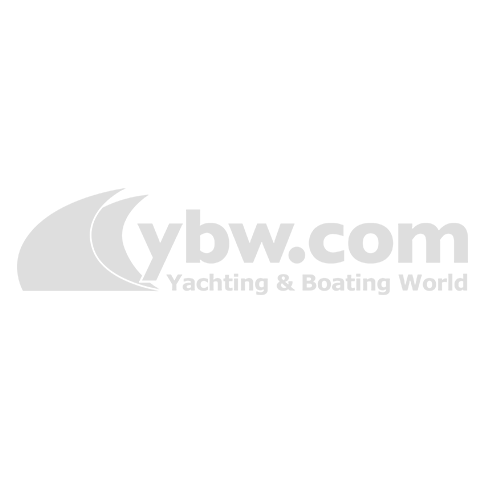 The menu has a modern British/European feel and is well thought out, with simple, classic and delicious dishes. Starters include mouthwatering scallops with spring onion, pea purée, soft shell crab (£13), octopus tranche, red pepper & onion confit, avocado, lime & chilli (£11.00) and chicken and leek mousse and Shimeji mushroom & honey roast ham, chive beurre blanc (£11.00). Mains feature duck leg confit, celery root, roasted plum, watercress soubise (£22.00), sea bass, fennel textures, Polonaise sauce (£21.00) and pickled & slow braised pork belly, buttered savoy cabbage, carrot purée, beetroot with cider jus (£20.00). Vegetarians are well catered for too with at least two imaginative and tasty options per course, such as an entrée of cauliflower and ginger pudding, spinach shortbread, Parmesan foam (£10.00) and mains of vegetable roulade, spinach, goat cheese with tomato fondue (£18.00) and gnocchi, Stilton cheese, roasted almonds and herbs (£16.00). 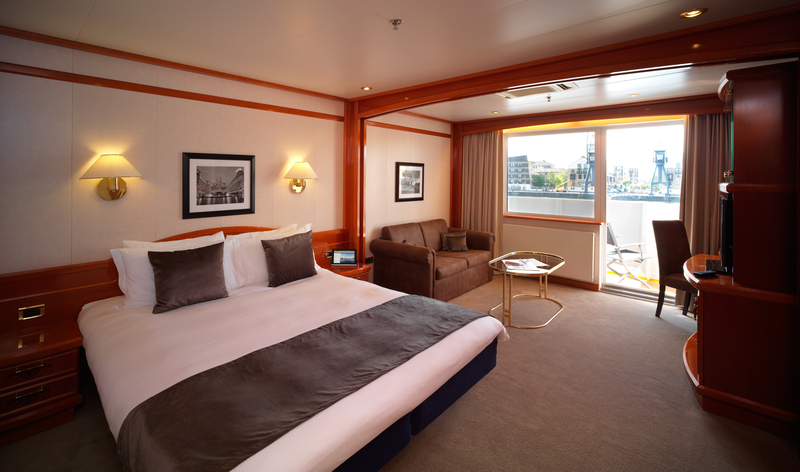 Sunborn London Yacht Hotel doesn’t just offer a luxurious stay, but a real experience. Its proximity to the Excel and the city and its connections to central London by public transports or boat, make it an excellent alternative to standard accommodation, whether you are in the capital for pleasure or for business, or simply want to spend a relaxing weekend pretending you are indeed chartering a yacht, sailing away from the hustle and bustle of the city.